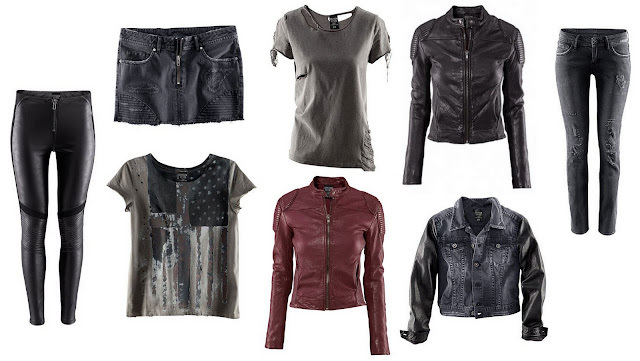 New H&M collection inspired on the main character of the movie and the book Millenium, Lisbeth Salander. Personally I love the red and the black leather jackets, the black leather pants and the T-shirt with the worn flag. Do you like it? By the way I'm looking for the perfect leather jacket and this is one of my options. Have a great night guys! Tomorrow the last day of the year, exciting! It has gone so damn fast. i love this collection..also if there are so few pieces..
Me encanta todo lo que sea de cuero o similar!!! Love the new collection,so stylish! love this collection! the pants and jackets are amazing of course - but I really like the t-shirts too! This is such a great collection, I didn't expect that! sv: Thank you so much :) the details on the black leather jacket is great! This just reminds me how much I need a leather jacket in my wardrobe. wow, great collection. Following you now, follow back, Happy New Year. Wow i love it . . .
i want this .where i can get this . . .